THIS JEWELRY IS MADE FROM MOTHER NATURE, NO TWO LEAVES ARE ALIKE. 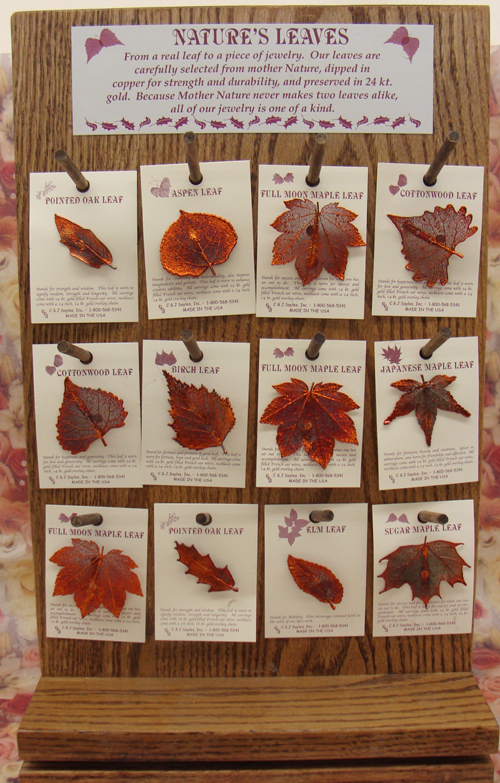 ALL OF OUR LEAF JEWELRY IS MADE FROM REAL LEAVES. A REAL LEAF IS PRESERVED IN COPPER, AND THEN PRESERVED IN 24 KT GOLD, LEAVING A BEAUTIFUL LACY EFFECT. 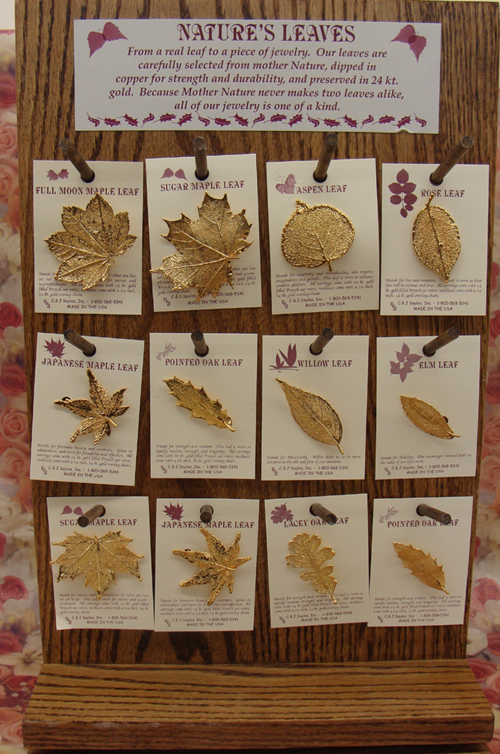 ALL LEAVES ARE MADE INTO PINS, DONE IN COPPER AND GOLD. ALL LEAVES COME CARDED WITH AN EDITORIAL ABOUT EACH LEAF. WE OFFER A HANDCRAFTED OAK, TWO SIDED SPINNER COUNTER DISPLAY, THIS TWO SIDED DISPLAY HAS 24 OAK PEGS, 12 ON EACH SIDE. THERE IS A $30.00 CHARGE FOR THE DISPLAY, WHICH IS OFFSET WITH FREE MERCHANDISE. THIS DISPLAY IS SHIPPED U.P.S. WITH THE MERCHANDISE ON THE DISPLAYALL PINS COST $7.00 EACH THE DISPLAY CAN COME WITH GOLD PINS ON ONE SIDE, AND PATINA PINS ON THE OTHER SIDE. $30.00 DISPLAY COST INCLUDED IN ABOVE PRICES. YOU MAY ORDER A 24 PC ASSORTMENT WITH NO DISPLAY FOR $168.00. email us your order (jsayles@rushmore.com), we will send you a paypal invoice by return email. © Copyright 2000- 2019 C & J Sayles Inc. All Rights Reserved. Designed by Midwest Marketing, LLC.